Modern design Electric operation Table Radio Translucent Top for use of c-Arm Image Intensifier such as general Surgery and certain special surgical procedure etc. 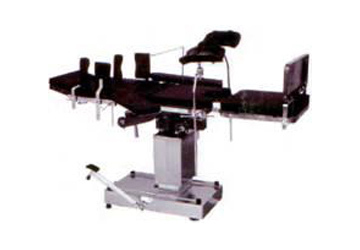 Central position table column and inter changeable head & leg section for maximum use of C-Arm image Intensifier. Smooth and accurate positioning by Remote Control for Hi-Lo, Trendlenbueg / Reverse Trendlenburg, Lateral Tilt & Head side Raising / Lowering. Base and column are covered with stainless steel sheet. 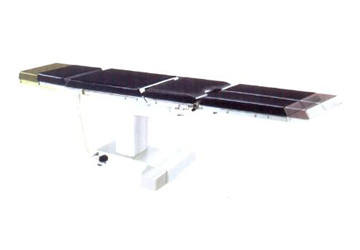 GL � A serial opration tables are classic in design and made up of high- intensity SSmaterial. 1.Wholly imported maintenance- exempted hydraulic power system with super service life. 2.Microelectronic controller, with optional foot paddle switch. 3.Operation body postures in line with ergonomics, suitable for different kinds of operations. 4.No gap, leakage or swing at the changing of body postures; ensuring the stability, durability and Safety of table top. 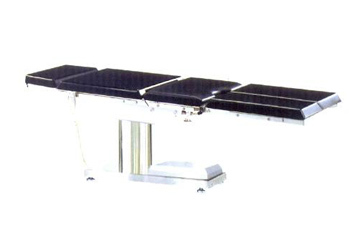 5.Optional electronic control floor lock to ensure the stability of the table. 6.Assembled polyurethane mattress shaped in 1shot at the table top, easy to disassemble. Electric operation tables are made of imported generators. It is easy for operation and stable in working. During the process of changing body postures in operations, it ensures no gap, leakage or swing; it ensure stability, durability and safety of the table top; and it ensures the generator working in consent speed , without noise, no leak of electricity or anti � electromagnetism. Even if the weight loading is increased, the speed of the generator will not be affected. 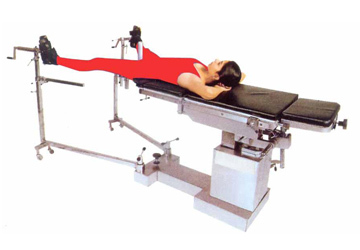 The t-shape base allows the operation table high stability and good mobility, and offer more space for doctors to move their legs, so as to decrease the fatique after long time operations. 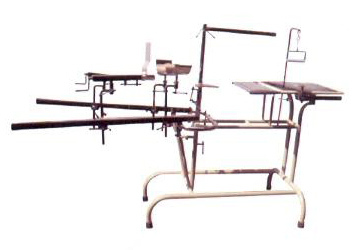 Suitable for common surgery, orthopedics, anorectal Surgeries; The Table top can be moved vertically and levelly, which provide the maximum space for perspective of C-Type buttock so as to ensure no blind angle for X-ray photograph. 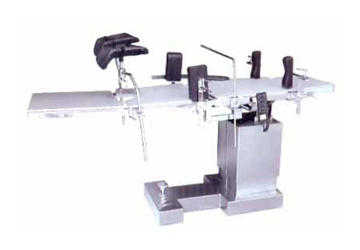 Manual hydraulic operating table are driven by hydraulics, air pressure or machinery method. It is fast, safe and durable. The surface have three systems; steel with spray-Painted; half-stainless steel, with spray- painted; half � stainless steel ; whole � stainless steel Table top includes parts of head, back, buttock and leg. Any model has inlaid hidney bridge. It is suitable for different body postures in different kinds of surgeries. A single action twin concealed cylinder Hydraulic pump controlled by a foot pedal. Fully S.S. covered based mounted on Heavy duty castors with auto floor locking system. 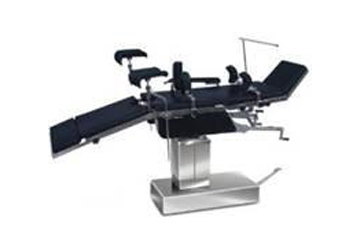 The Detachable leg section provides easy lithotomy positioning. Five section S.S. Top with l arge perineal cutout for drainage tray, built in Kidney bridge. The improved hydraulic system provides smooth movement and the speed of lowering the table is permanently set. The table is finished with extra hard, permanent finishOvan baked paint and all the accessories are bright chromium plated. Minimum Height: 80 � 5 cms. Maximum Height: 95 � 5 cms. Lateral Tilt: 20+ 2 cms. Pelvic Rest in 3 Sizes. Spinal Frame with Head Support. 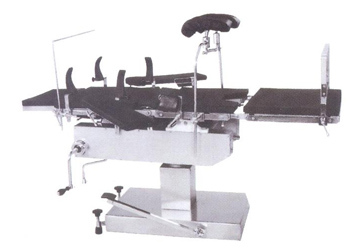 This is a latest design head end control operation tables suitable to perform all operations such as abdominal, thyroid, gall bladder, kidney, neurosurgery, plastic surgery etc by obtaining flex, r eflex, lateral tilt, trendelenburg, reverse trendelenburg and chair position by the anesthetist who can control these positions by sitting at the head end side of the table. Study and heavy duty base covered S.S. sheets for durability of table. Five section S.S Top, with detachable legend section. All the positions can be maneuvered from head end side by moving the handle as mentioned on the indicator dial. Minimum Height: 75 � 5 cms. Maximum Height: 95� 5 cms. Tubular Frame work on 10cms castors with brakes. This is anexceptionally fine surgical table. With facility of hight adjustment by crank mechanism. Offering a very comprehensive range of positions viz., "straight", trendlenburg & reverse trendlenburg positions, chair, lithotomy position etc. Tubular Frame work on 10cms castors with brakes. 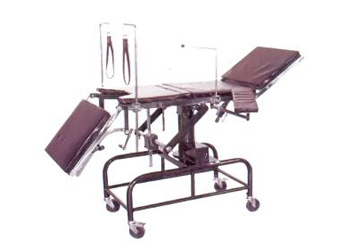 This is an exceptionally fine surgical table. With facility of height adjustment by crank mechanism. Offering a very comprehensive range of positions viz., "straight", trendlenburg & reverse trendlenburg positions, chair, lithotomy position etc.